Five years ago I completed my first residential design project in France involving the complete restoration of a country home in the tiny hamlet of Le Grand Serail in the northern Charente region. 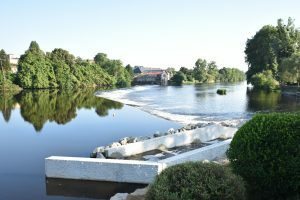 The closest market town to this idyllic spot is the picturesque riverside town of Confolens, home of the annual Confolens Festival of folk music and dance, which is a 45 minute drive from Limoges to the south east or two and a half hours from Bordeaux to the south west. You can read more about Confolens here. Whilst I have previously written about this remarkable experience, the project is best described as the restoration of an abandoned 350 year old stone structure set deep in the beautiful rolling hill country that is so characteristic of the northern Charente area. In appreciation of the history and sense of place of the building as a working farmhouse with several outbuildings, many architectural elements including the original solid oak beams were exposed and restored along with the stunning two feet thick stone walls. 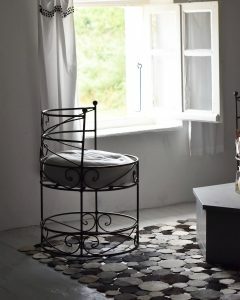 The interior was designed in a simple and minimalist way so as not to detract from these marvellous features. You can read more about the Chaumiere Miand project here. After spending 5 consecutive summers refining various features of the property that I named ‘Chaumiere Miand’, including the creation of several outdoor summer rooms set around the ancient two storey hangar which in olden times had provided overnight shelter to the farm animals, it was time to begin looking for a town project that could serve as both a weekday residence for up to nine months of the year and a commercial space for Andrew Loader Design. 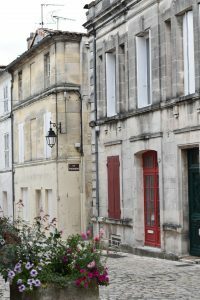 Discovering Cognac – The search for the ideal property took me further south toward Bordeaux and to the beautiful and iconic town of Cognac. Cognac and the surrounding area are extremely well positioned being only an hour or so from Bordeaux and the same from the French Atlantic coast. From early July, the new TGV high speed train began operation making Bordeaux just 2 hours from Paris, effectively a return day trip. Cognac is also one of the most famous towns in the world being home to Remy Martin, Camus, Martell, Hennessy, Baron Otard and Courvoisier among others. At only one and a half hours drive from ‘Chaumiere Miand’ to the north, the location is simply perfect. You can learn more about Cognac and the Cognac area here. 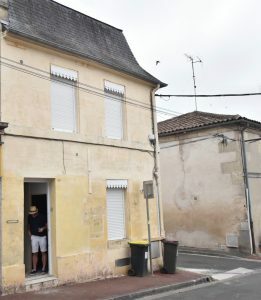 The Search Begins – I looked at many Cognac homes over the course of just a week and ultimately settled on the one that was the first to catch my eye and the last I got to inspect. The house is located in the historic centre of Cognac and is only a two minute walk to the Place Francoise l ER ( the centre of Cognac ), the Jardin de Public Cognac, the famous House of Camus and the Theatre Municipale among many other well known sites. Occupying a corner position, the house dates from prior to 1850. It is constructed entirely of stone and is crowned with a very attractive mansard slated roof. It is set over three levels including a below ground cave, ground floor, first floor and a grenier set under the beautiful beams and supports of the mansard roof which create a stunning effect that resembles the bones of a fish. The Reveal – The house had been renovated many times throughout its life, most recently in 2008. 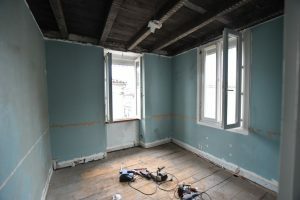 Unfortunately, what this often means in France is that each time a renovation is carried out, a new layer of materials is put over the top of what is already existing to create a more modern look. Instead of structures being restored, often they’re given cosmetic treatments to make them look more aesthetically pleasing which can hide the fact that major works including electrical, plumbing and joist strengthening among others are required. After viewing the house, it was clear to me that we would indeed have to undertake a complete back to bones strip out and following, begin the process of restoring the original structure. 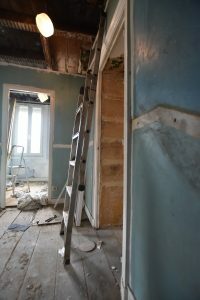 This would include the removal of the kitchen, bathrooms, floor and wall coverings, ceilings, architraves, replacing damaged joists and floor boards, rewiring and re-plumbing. After going to tender for the works scope, I selected an experienced building company who began the enormous job of the strip out. This revealed the reality of what lay beneath the many cosmetic layers that various owners had added to the house over the years. Fortunately, the house was in very good shape and repair works to the timber structures were not significant. With the strip out completed, we took the opportunity to spray for termites and to plan for insulation of the complete structure from the grenier down. The next stage of the project was the finalising of the design specifications which can only be fully completed when the reality of the strip out phase is fully known. I learned this during the ‘Chaumiere Miand’ project where I presented to the builder my fully documented interior designs prior to the project beginning, only to find that the strip out revealed a very different picture resulting in a complete re-work of the whole design. The Beginnings of ‘Maisonette Pierre’ – For the Cognac house, since named ‘Maisonette Pierre’, I decided on a traditional and elegant Paris apartment inspired design. A very simple bright white palette, the original oak floors and the staircase stained to a dark ebony shade and decorative architraves, corniches, wall mouldings and panelled interior doors reinstated to provide traditional pattern and texture to the various rooms. For the bathrooms, large scale tiles of statuario patterned porcelain were chosen for an uncluttered, streamlined look which enhances the feeling of space. I also decided to incorporate a hidden wall French kitchen into the renovation, whereby the kitchen, which will be installed across a 3.6 meter wall, can be completely closed off with bifolding panelled doors. When the whole kitchen is in use, the doors which recess into the wall, can be fully opened or if not, just a section can be opened to give the alternative impression of a glamorous cocktail bar behind. The extensive grenier area, which is currently reached by a half set of stairs and a wall mounted ladder, will have an antique iron spiral staircase fitted to replace the ladder and in the last stage of the project, will become the Andrew Loader Design studio. Also in this last stage will be the fitting out of the cave to accommodate a full floor wine cellar. We’re now at the stage of the interior fit out of ‘Maisonette Pierre’ when the design begins to come to life and I can’t wait to share this exciting next stage of the project as it further unfolds – along of course with lots of photographs of the installation. You can read my update from January 2018 here.